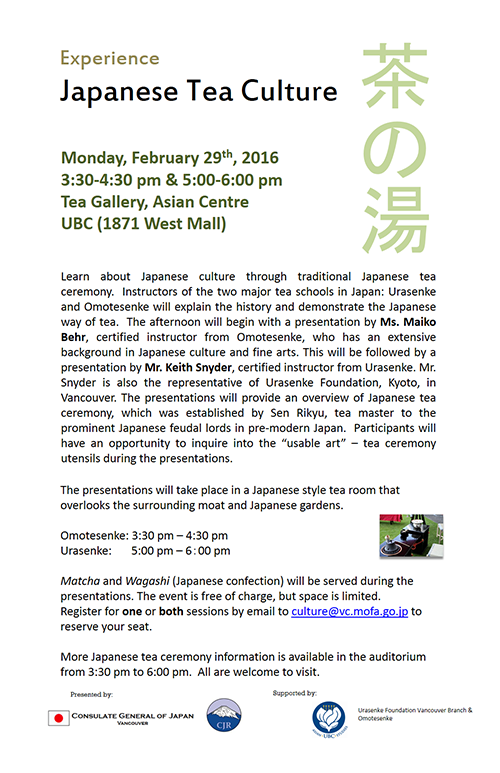 The Consulate General of Japan and the Centre for Japanese Research are pleased to present a special Japanese tea ceremony presentation on Monday, February 29th, 2016, at 3:30 pm and also at 5:00 pm at the Tea Gallery, UBC Asian Centre. The presentation features Japanese tea ceremony lecture and demonstration, as well as Matcha and Wagashi tasting. Admission is free. Early reservation is recommended as the presentation is expected to fill up quickly. Please reserve your seat with your full name by email to culture@vc.mofa.go.jp.